Arrive at Maun Airport and meet your Afrika Ecco representative who will be waiting to take you to your accommodation for the night. As you will be spending your days in the heart of the African bush you have the opportunity today to quickly purchase any forgotten personal items at a nearby small shopping centre. Arrive at Audi Camp where you will sleep in tented safari suites for the night. Use the afternoon to refresh and enjoy the location on the Thamalakane River before having dinner at the lodge restaurant and heading to bed. Early wake up at Audi Camp and full breakfast served in the lodge restaurant before you are met by your guide, camp assistant and chef to begin the journey to the Central Kalahari Game Reserve. The 7 hour journey on a game viewer takes you through the Matswere Gate into the famous Deception Valley on towards a private BOGA (Botswana Guides Association) campsite, which is reserved for local guides only ensuring a private and authentic safari. 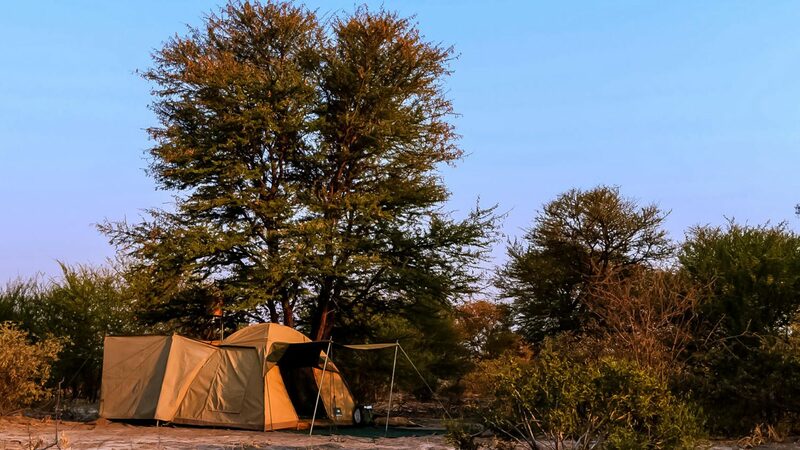 Set up camp and relax with a refreshment until darkness falls and dinner is served under the Kalahari stars. After three delicious courses and a long day on the road, it’s time for bed! Early wake up and a cooked breakfast at 06h30 before heading out on game drive visiting Deception Pan and numerous waterholes in this semi-arid reserve. Arrive back at camp after 4 hours and refresh with warm bucket showers and a tasty lunch before relaxing at camp for the afternoon. High tea is served at 15h00, after which you depart for game drive until sunset. Return to camp for dinner and a chat around the campfire under the stars. Meet your local pollers and enjoy the wild environment before a shower, 3-course dinner, and your first night in the Delta! Early wake up with the birds, followed by breakfast with tea and coffee before your local guides take you on a long walk on Chief’s Island. Climb into a mokoro and enjoy the short journey across the waters from the campsite to Chief’s Island. From here, you take to the famous island on foot for a 3-4 hour guided walking safari. Return to camp via mokoro, enjoy a freshly prepared bucket shower and a delicious brunch/ lunch at about 12pm. Spend the afternoon at camp for a siesta, reading, or bird watching. High tea is served at 15h00 after which you can look forward to an afternoon mokoro cruise to the nearby village of Xaxaba where you can enjoy a locally guided tour and the opportunity to purchase curios. Early wake up followed by breakfast, tea and coffee. This morning you leave Xaxaba and head back to Maun on a 3-4 hour boat cruise. Upon arrival in Maun, you will have the opportunity to buy any personal items you need and enjoy brunch at a restaurant before departing in a game viewer destined for Moremi Game Reserve. Arrive at Moremi’s Maqwee Gate (South Gate) and continue into the reserve to your private BOGA campsite at Xinii. After setting up camp, enjoy a short sunset drive to Xinii Lagoon for a game viewing experience to remember. 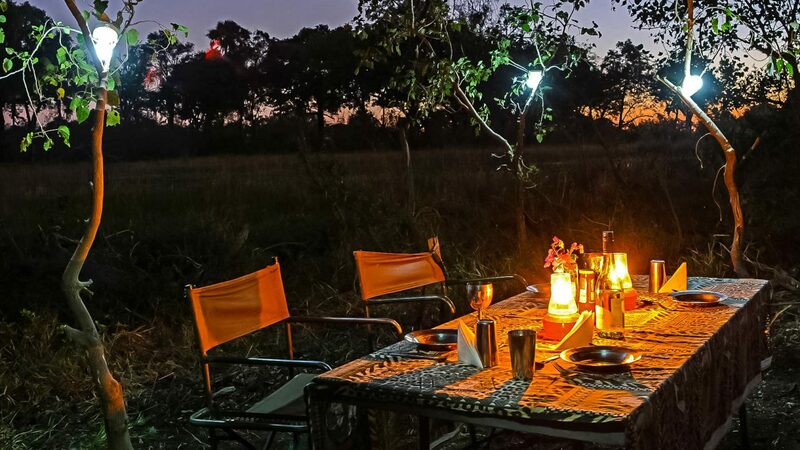 Return to a firelit camp, a 3-course dinner and your first night in Moremi. Return to camp for a refreshing shower and lunch before enjoying a quiet afternoon siesta. High tea is served at 15h00 and is followed by game drive until sunset. After game drive, arrive back at camp and enjoy sitting around the fire before indulging in a 3-course dinner, and then, your welcoming bed. Early morning wake up and breakfast, followed up some sun screen application and preparing for a full day out in the Moremi. Your chef prepares you a packed lunch and a cooler box, which is packed into the game viewer alongside the coffee and rusks for that mid-morning stop. Depart the camp after breakfast and enjoy a long day on safari, returning in the mid-afternoon for tea and a rest before dinner is served under the stars once more. Extra early wake up with hot coffee and breakfast followed by camp pack-up and then boarding the game viewer for the 5-6 hour journey through Chobe to Savute. Enter Chobe National Park at Mababe Gate and enjoy the scenery and game viewing opportunities before stopping for packed lunch in a shady picnic spot. Arrive at private Savute BOGA site, set up camp and relax. High tea is served at 15h00, after which you embark the vehicle once more for an afternoon game drive to the famous Savute Marsh. Return at sunset to a campfire and good food under the stars before turning in for the night. Early wake up with tea, coffee, and breakfast before boarding the game viewer for a long morning game drive in this special region of northern Chobe. Stop for coffee when the time calls for it, and finally return to camp just before lunch is served at 12h00. A warm bucket shower is prepared for you, and refreshments are served, as you relax for the afternoon before high tea at 15h00 and your last afternoon game drive departs. Enjoy the wildlife, the scenery and the sunset before returning to camp for an excellent 3-course meal and conversations around the fire, after which you head to bed for your last night in the bush. Early morning wake up, breakfast, and pack up camp before hitting the road through Chobe and back towards Maun. The scenic game drive route takes 6-7 hours, so packed lunch will be served on the way; however, guests may opt for light air transfer to Maun at an added cost. Arrive in Maun and connect with departing flight home. prices or sales by third party suppliers or any other circumstances which is beyond our control.